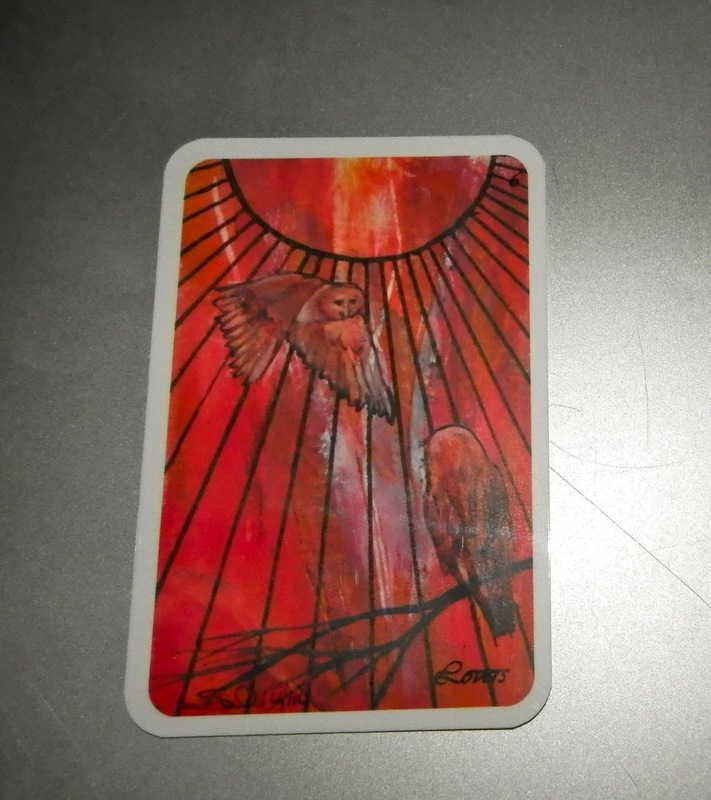 Today's Draw: The Lovers from Owl's Arcana by Beth Seilonen. Are you aware of all the soulmates you have in this world? While some may be here to teach you something, do have some that seem to have no clear reason for being in your life? Is there anyone who makes you feel like your spirit self—perfect and unfettered—whenever you're around them? Today we're doing it up old school at the Daily Draw—no Deck of 1000 Spreads, no Lenormand or oracles, just full-on tarot. The Lovers is a card that different people interpret different ways. Some feel it's about soul mates. I usually see it as a choice between love and something else. Like if a new job is going to make you relocate and your partner can't come with you. So that's how I usually read this card...what is taking you away from giving and receiving as much love as possible? Looking at Beth's card with the owls, though, it makes me think of the people we come across in our lives that we may or may not consider "soul mates" but are in our lives for a special reason. I have a pretty broad definition of what a soul mate is, so I consider most of the people you come across to be part of your "soul tribe". The other day I was thinking about this man I met a long time ago. He wasn't someone I was attracted to in the usual sense of the word...romantically, physically, socially. He was a friend of a friend, so I probably only saw him maybe five times in my life. But each time I came near him, I felt so comfortable with him, like I'd known him forever. Truth is I felt more "right" around him than I ever did with any man I ever dated. And you're probably thinking to yourself, "Tierney, you shouldn't let a man you feel so right around slip through your fingers." But everything else about him was wrong...his lifestyle, his dreams in life, his personality...the WHO of who he was was all wrong for me. Yet there was some indescribable sense of rightness between us. And I'm pretty sure the feeling was mutual. Since then, I've met a couple more men...men with such a right energy and feel, yet completely the wrong men for me and my lifestyle. It feels like "our time" was in another lifetime or one yet to come...like the soul recognizes the other as someone profoundly important. I suppose another possibility could be that I am but one part of a fractured soul and they are other parts. It feels that right. And with men who are just really wrong for who I am in this lifetime. I wonder how many others I might have come across in my life, but didn't see in this way...didn't have the spiritual vocabulary to recognize as such? All of these men are men I've met in the past, say, dozen years. How many others might there have been? And I would think some of them would be women in this incarnation. Who have I ever felt so safe, and "right" and "me" around that I've forgotten or been unable to feel? Because I think in this lifetime, at least, we really just found each other as a way of saying, "hello, old friend. I'm never far. I've never forgotten what we've shared. And I can't wait until we're together in spirit again." It makes me cry just to think of it. How beautiful these little meetings are. Honestly, with that first one it has always brought me to tears thinking of how...different? whole? safe?...I felt around him. I will probably never see him again. But we found our way to each other in this lifetime to remind each other what incredibly perfect beings we are when we "shuffle off this mortal coil" and join together again in another place. Is it better to be ignorant of what it must feel like to exist in a world without the neurosis that is our humanhood? Or is it better to know how it feels and not know if you'll ever get to feel it again in this lifetime? So that's what the Lovers card says to me today. It speaks to these connections we have with other people—not the people who are here to annoy us, mirror things back to us and teach us lessons. Those are soulmates, too, in my book. But I'm talking about the people who exist somewhere at the fringe of your life that just feel right, even though you may have little else in common with them—the people who seem to have no other purpose in crossing your path, but to remind you that there's more than just a human inside you. There's something beautiful and eternal and utterly right that is always there, close enough to embrace you in their wings. Tierney, I too have had many of these encounters and it's often been difficult to acknowledge that although the soul connection is right - the rest isn't. Many years ago when I was single and talking with friends we discussed this phenomenon and how easy it is to concentrate on just the soul and how it feels almost a betrayal at times when we discover that the soul and the personality are so different. We decided that because of our energetic sensitivity we often connected soul to soul, forgetting that most are not living as their soul, yet, and that we must never lose sight of the personality they are living in. Acknowledging that made it so much easier to understand and enjoy the connection without attempting to create an ongoing relationship which admittedly was all wrong on many levels. Love your insightful sharings. There is so much good stuff in what you said, AnnaMariah. I think people often mistake that connection for "true love" because we don't understand what's going on. That's why I wonder how many times it might have happened before I caught on it. Because once you force it into that relationship mold. the relationship often goes so bad that you don't remember any quality of peace and "rightness"...or you convince yourself you were wrong.